Today, in the matter of Bryan v. McPherson; City of Coronado, the U.S. 9th Circuit Court of Appeals issued what appears to be a significant ruling on the propriety of police officers using tasers. The Court held that a police officer‘s use of a taser against an individual, without warning during a traffic stop for a seatbelt infraction, was unconstitutionally excessive under the circumstances. The circumstances in the case included the fact that the plaintiff was unarmed, did not level a verbal or physical threat against the officer, was 15-25 feet away from the officer, and was facing away from the officer. According to the officer, the plaintiff took a step towards him, justifying the use of the taser. The 9th Circuit rejected this argument, ruling that even if the plaintiff had done so, the officer was not justified in using an intermediate level of force. One of the most interesting aspects of this decision appears to be the Court’s characterization of the taser as intruding upon a person’s bodily functions and integrity in a way that other non-lethal uses of force do not. As such, use of a taser must be justified by a strong governmental interest that compels employment of such force. The second interesting aspect of the case is the Court’s characterization of what constitutes “resistance.” In many cases, police officers use the argument that a suspect was “resisting” in order to justify the application of a higher level of force than what is necessary under the circumstances. Ever since its invention in 1974, the taser has been the subject of close scrutiny by civil rights advocates and the media. Since at least 2004, Amnesty International has expressed grave concerns about the ease with which police officers use taser to inflict serious bodily injury on individuals. You can link to Amnesty International’s website discussing tasers here. 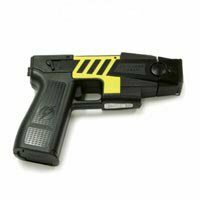 Taser International, the company that manufactures the taser for law enforcement agencies, has also been the subject of numerous lawsuits over the weapon. This entry was posted in civil rights, police brutality, police misconduct and tagged Add new tag, Amnesty International, police, Supreme Court of the United States, Taser International, U.S. 9th Circuit Court of Appeals, U.S. Supreme Court, United States, United States Court of Appeals for the Ninth Circuit. Bookmark the permalink.